We flew to Dublin and hired a car and headed west. 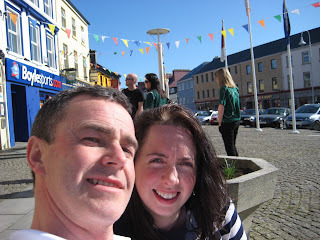 Unfortunately in the morning it was foggy so no scenery gawping but by the time we hit Galway the sun was shining. Du e to the demand for accommodation we were staying in Clifden nearly an hour away from the hub of the race and staying above a sports shop..... what a find!!! Clifden is absolutely lovely and the B&B was fantastic. Gerry and Siobhan who owned the B&B and sports shop could not have been more lovely or helpful. We parked the car and headed to the nearest pub and sat outside in the sunshine drinking Guinness. A really nice way to spend the afternoon. Mark was up early to get the bus to the start of the race and since he was running a few miles and therefore not around to play with for a while I decided to investigate a potential run for myself. An hour later following my sight seeing I went back to the B&B and put on the running gear. The scenery was beautiful and very pleasant but unfortunately the run was not so good. My right leg was very sore and I ended up running like an eejit with a dead leg. The passing cars must have thought i was a circus act who had escaped. Following my disappointing run I got in the car to go and cheer on Mark at the finish. The finish was a great atmosphere with the announcer gentleman in top form. 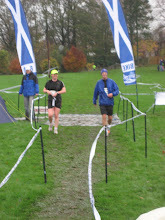 Mark and Michelle came in on 6hours 16 minutes which for a very tough 40 mile course was a great time. On the night of the race we headed to the pub and met up with fellow WHWR family member Jeff. Lots of Guinness and good chat followed. 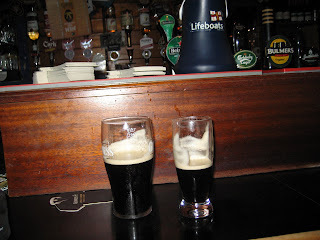 Next day we drove back to Dublin airport and our lovely weekend came to an end. Gelly, getting concerned about you, you seem to have lost your innocence!